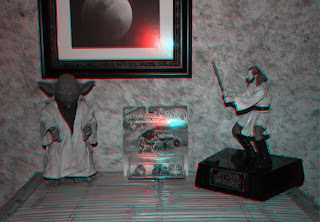 Make Your Own 3D Images!! With the total lack of Solar activity the last couple of years you can imagine how excited I got when a couple of prominences popped out of the Sun's chromosphere the other day. I was able to capture the prominences with my Canon 40D attached directly to my Coronado PST. This little scope allows a narrow band of the light spectrum through, the Hydrogen- alpha emission which blocks out the blinding white light and lets the beautiful Solar chromosphere through where all the action happens. Prominences are powerful explosions on the Sun which shoot tons of Solar plasma into space, the prominences above and below are 10 Earth diameters high. As I was taking pics one of the neighbours asked if I was taking pics of the Sun again. You'd think that a camera attached to my scope pointed at the Sun would be a good clue,... yes.... yes it would, that is if they could see it, you see to prevent the glare of the Sun from reaching my camera and preventing me from seeing the Sun in my camera's LCD monitor I have a bath towel swung over me and the scope, odd picture to say the least. You can see the image above on Sky and Telescope's web site, cool. All this activity was happening just after NASA announced in a press release that the Solar wind was at it's 50 year low. Seems the pressure of the Solar wind has dropped 20% since the mid 1990's. The long term implications could be quite serious. The Solar wind inflates our protective Solar System Heliosphere. The Heliosphere is like a magnetic bubble surrounding and protecting the planets from deadly cosmic rays originating from outside our Solar System. Less solar wind pressure, less bubble, less protection, which means more cosmic rays, which will have a detrimental effect on any kind of space travel, more satellite damage and on top of all that there are some scientists that believe there is a link between climate change and cosmic rays. Well there may not be a pot of gold at the end of the above rainbow, at least not for the Hubble. Hubble is down, one of it's vital pieces of equipment, the Control Unit/Science Data Formatter is broke, or at least one side of it, they are now trying to get the backup side B running. The Formatter stores and transmits all the science data from all the equipment on Hubble down to us on Earth, very serious problem. Needless to say the Shuttle mission to repair the Hubble will be on hold until NASA determines what their next move will be. 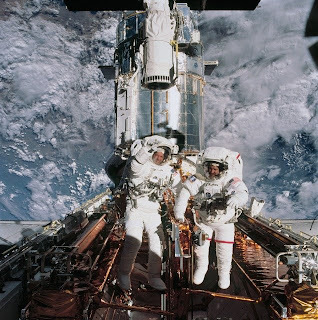 If they do happen to get the Hubble up and running NASA will then have to make a decision whether or not to send another Control Unit up with the STS 125 crew for installation, I vote yes, what good is all the new fancy schmancy equipment if the backup unit dies. I'll leave you now with a cool clip of some Solar prominences in action. If you have been following my blog for any length of time you'll know I have purchased both Lunar and Martian property. 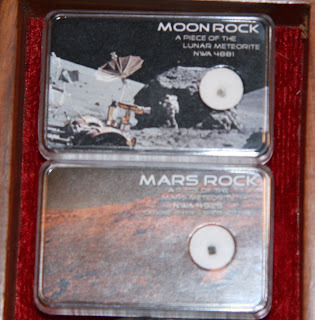 Well now I have in my possession both Lunar and Martian actual property in the form of rocks!! That's right I have actual pieces of both celestial bodies that I can hold. I know what you're saying, "Big Whoop", wow I can't believe you said that, ...well actually you didn't say that, I wrote it, but that's besides the point, just think about it, I am holding a piece of a celestial body other than Earth's. It's journey probably started when a meteor pierced through the Martian atmosphere and collided with the planet, ejecting rock faster then the Martian escape velocity into space, it ventured forward into our Solar System to be captured by Earth's gravitational pull to become a falling star to land on our planet, then it was found by a lucky person. Some of the fallen meteorite will be used as research and some to be sold on eBay and in meteorite stores.... enter moi, I put it under a microscope to show you all what it looks like, what a fantastic journey. How do we know it's from Mars? Well with all the information scientists have gather from spacecrafts such as the Voyagers, Rovers and Phoenix we know the mineralogy of the planet and Martian Meteorite NWA 4925 is a perfect fit. There are only around 50 Martian meteorites that we know of to date that have landed here on Earth, so they are fairly rare and expensive, but there are some Martian Meteorite owners that have cut up some of their meteorites into tiny little pieces so as to make it affordable for people like you and me to own. As you can see from the above image the samples are very small so you have to be very careful with handling the sample, least you loose it. The very first thing I did when I got one of my samples was open the box to play with it.... not a good thing, dropped it on the carpet, down I go, the cat too, looking for my missing rock, the cat's all over it, I'm on my hands and knees , I'm pushing the cat away, the cats barking at me, I'm barking at the cat, not a pretty site. Finally found it before the cat, put it under the microscope and the images above are what the sample looks like at 40 and 100x magnification, geez what I do for science. Between the mechanical breakdowns at CERN and their regular winter shutdown looks like the LHC will be down now till next spring. 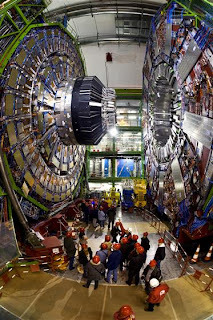 Cern has been plagued with problems, from mechanical to idiot hackers, it's been a Public Relations nightmare. CERN is still getting calls and emails about the imminent destruction of the planet by the Black holes they hope to create, hopefully once they are up and running spring 2009 they will have a little better luck. I'll leave you now with a video of Martian Meteorite NWA 4925 taken with my Celestron Digital Microscope. Well I got my Moon Pleiades conjunction shot but it was nearly a bust...literally. Thought I would enter it in the Creative Photography Contest. I'm minding my own business on the side of a dark country road drinking a Pepsi when a car comes speeding along, screeches to a halt across from me, A guy gets out of an unmarked car, great it's a copper, starts walking towards me and says. Copper: "What are you up to?" Me: (Thinking he can't see me too well that far away, still in the dark, also I can't see if his gun is drawn, yikes I think to myself.) "Taking some images of the Lunar/Pleiades conjunction." Copper: "I see, I thought you were a youth drinking, you're obviously not that." Copper: "Well good luck with your picture taking and have a good night." I have really got to stop taking pictures in the dark on side country roads. I had to wait quite a while for the Moon to rise above all the atmospheric dust and clouds on the horizon before I got a clear shot of the conjunction, then I took two images at different exposures. A one second exposure to capture the cool Lunar Corona and Pleiades and a 1/450 second exposure for the Moon, I then blended the two images in Photoshop to get the final image above. Cern has been having some of it's own problems. Just last week they had to replace a faulty transformer in the LHC and then last Friday they had a melt down, seems a faulty electrical connection between two magnets melted causing a mechanical failure. Expected completion date of the fix is a couple months. Won't be getting sucked into a Black hole anytime soon. I'll leave you now with an animated Moon Rise taken on the Moon Pleiades conjunction night, you can see what I was up against, the Moonlight was able to burn through the light cloud cover, wasn't the case for the Pleiades. Due to the phasing out of the Shuttle program by 2010, STS-125 due to launch October 10th. 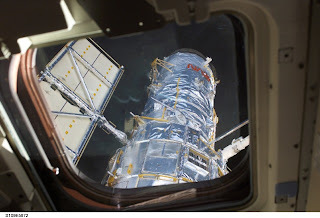 will probably be the final opportunity to patch and repair the 18 year old Hubble Telescope. What a ride it's been, wow. This little scope that could has helped scientists figure out the age of the universe, around 13.7 billion years old, found numerous black holes, and imaged tons of beautiful images for people like you and me. I remember the day I got my first computer and color printer, first stop, Astronomy Picture of the Day to print off tons of Hubble images, I still have them in binders today. They have a very aggressive replacement/repair agenda planned out for Hubble. First off they will be replacing WFPC2, one of Hubble's major cameras with the 10x better WFCP3 as well as replacing the Scope's rechargeable batteries which power the Hubble's scientific instruments during the night time of each orbit. They will also replace the Hubble's 6 gyroscopes, do you know that it has been working on only 2 since 2005? They will also replace a faulty Fine Guidance Sensor with a refurbished one and install thermal insulation to help keep the equipment at a cool running temperature. Previous repair missions to the scope have usually just entailed removing or installing equipment, this time out they will be attempting to repair a couple, 1. The Advanced Camera for Surveys (ACS) and the Space Telescope Imaging Spectrograph (STIS) or as they call it, the Black hole hunter. But that's not all folks, oh no , they will be installing a Cosmic Origins Spectrograph (COS), this will be a key instrument, answering some of the more profound questions of the cosmos such as how galaxies have formed and evolved. This makeover should give the Hubble another 5 good years of life, maybe as much as 10. 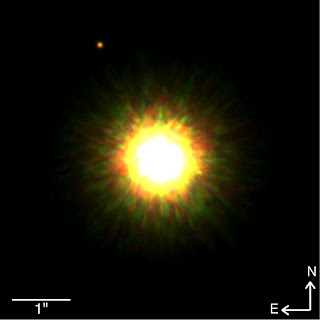 The image above may be the first ever actual photograph of an exosolar planet orbiting a star similar to our Sun, more info gathering has to be done before they can say conclusively that it is. The planet has 8x the mass of our Jupiter and is about 330 times out from it's Sun as we are from ours, the image was taken with the Gemini North Telescope in Hawaii. What I find interesting is, if it is actually orbiting at that distance away from it's Sun, just think of how many possible other planets are in between, very cool. Last but not least, tomorrow night, get ready for another occultation/conjunction of the Moon and the Pleiades!! 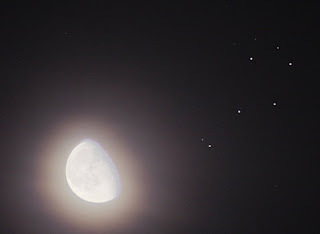 For around 60-90 minutes our Moon will cover then uncover some of the stars in the Pleiades cluster, chances are if you live in the east side of North America you'll get an occultation, the west part, a conjunction, the Moon will have uncovered the Pleiades by the time it rises in the west. Just look to the NE at Moon Rise to see the celestial magic, I love when those two get together, so pretty. I took the image above last night as a dress rehearsal, to get the lay of the land, exposure settings, access to the site, short cuts, in case a train gets in my way, ect., can't leave anything for chance, forecast is looking excellent, getting excited, stay tuned for pics. I'll leave you now with a Moon Rise image I took tonight. Imagine with me if you will, you are looking out of an entrance of a cave , onto the surface of a moon orbiting a Saturn type exosolar planet in a galaxy far far away, hey at least that's what I do. My Creative Photography contest image above was taken with my Celestron LCD Microscope while looking for micrometeorites, the black sphere in the middle of the image, I pasted an image of Saturn I took a year ago onto the microlandscape to complete the image. The very cool thing about this microlandscape, besides the fact it has a micrometeorite in it, is I had just collected this sample from the down spout of my eaves and it was wet, so this microlandscape comes complete with it's own ecosystem so to speak, see the reflections from the surroundings, like the cave has water in it. It's that time of year again, time for my favorite Full Moon. 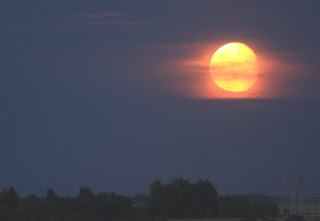 The image above is the September Full Harvest Moon. 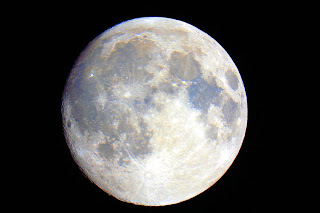 I took the image yesterday with my Canon 40D attached to my Meade telescope, I also added a touch of saturation to bring out the colors of the various minerals of the Moon, the blue for instance in the Sea of Tranquility indicates it is rich in Titanium. I'd like to leave you now with a microlandscape animation. That's right you heard me, or read me right, you too can make your own 3D images. By following this simple tutorial you can enter the self made world of 3D. I know what you're thinking, "Bob that's crazy talk, how can you make your own 3D images?" Well I'll get to that in a moment, but first of all think of the possibilities, one word....... "Weddings", everyone has those ordinary B&W or color photos of that special day, blah, blah blah, how would you like to give something special, a 3D image complete with 3D glasses of the lucky couple sitting by a lake, or a pond, or on a swing, how awesome would that be? My youngest daughter is getting married next year, guess what I'll be getting them? To start with, take a picture of something, flowers, horses, trees, Yodas, people, whatever you like, now take another picture, this time with the opposite eye, in other words move the camera over, around 3 inches, moving in parallel lines and keeping track of which picture is from the left and which is from the right, you are basically taking stereo images of the subject to combine later in your photo processing software. Next open your images in your editing software, I have photoshop so I will be using photoshop terms from here on in. 1.Rename your photos, eg. Yoda L, for Yoda left image, and Yoda R, for Yoda right image. 2. Maximize your left image, click on 'Image' on the top toolbar, go to 'Mode' then 'Grayscale', the left image is now Grayscaled. 3. Repeat for the right image. 4. Minimize the right image and maximize the left image, so the left image is active, click on 'Image' on the top of the toolbar once again, go to 'Mode', this time click on 'RGB color', now you have your left image as RGB color and your right image as Grayscale. 5. With the left image active still, go the the bottom right of photoshop, click on the channels tab, next click on the blue channel at the bottom so it is shaded, next with your finger on the shift key click on the green channel, now you will have the blue and green channels highlighted. 6. Minimize the left image now and maximize the right image, with the right image active, click on 'Select' on the top toolbar, select 'All', you will see a dotted line around the whole image, now go to 'Edit' on the top toolbar, then select 'Copy'. 7. Minimize the right image and maximize the left image, with the left image now active go the top toolbar and click on 'Edit' then 'Paste', you have just pasted the left and right images together, if you go to the bottom right where the channels section is and click on the RGB channel you will see a red blue image, isn't this getting exciting? 8. It's almost done now, click on the Red Channel so it is the only channel shaded, now go to the RGB channel and click on the little side box so an eye appears in all the side boxes on all the channels, but only the red channel is shaded, this will allow you to move only the red channel to fine tune the 3D effect. 9. 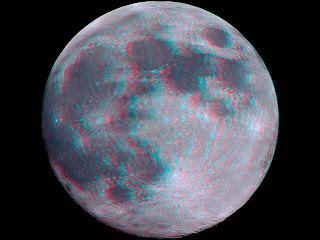 What you have to do now is fine tune the red and blue separation, go to the tool section on the left side and click on the move tool, I wear my 3D glasses for this part, with the move tool click on the composite image and move the red channel until you get the best 3D effect, once you are satisfied, you are done, you may have to crop any red off the image after moving that layer around, then presto, you have your very own 3D image. If I have totally confused you, just click on the link at the top of this post, it will take you to the tutorial I followed. 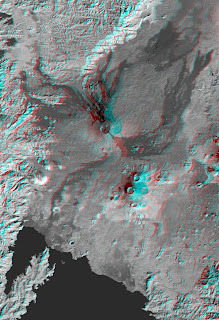 The guy who does 3D images for the NASA missions wrote it. Talk about pop a doodle doo, the Moon image above and the Nyiragongo Volcano below are a couple of my favorite NASA 3D images, very cool, they pop right out at you. 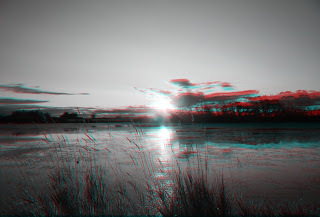 So if you really, really, really want to make your own 3D images, I still have some 3D glasses to give away, just email me your address and I will send you a pair. A late addition to this post. Ruth one of my readers had commented that she thought I'd be talking about the "Big event", Cern's start up of the LHC, well they did successfully steer a beam around the 27 km loop but the actual smashing of the beams won't occur for a few weeks yet, so no black holes, and they go on to say in the press release that new results won't be appearing for another year, which leads me to believe we probably won't know the exact date they will be up to the power needed to actually create black holes, kind of keeping us in the dark so to speak. I will continue to read all the articles I can get my hands on to let you know the current happenings as they occur. A study called, " Review of the safety of LHC collisions" was just released stating not to worry , everything is going to be okay, we are not going to all be sucked into a black hole when the Large Hadron Collider goes live September 10. To sum it up in a nut shell, the report says we, we being the Earth and other astronomical bodies have been bombarded for billions of years by cosmic rays of far greater energies produced by the LHC and that the ongoing stability of Earth and other astronomical bodies indicates that such collisions cannot be dangerous. 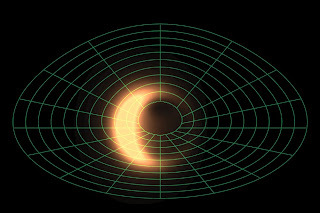 I got a comment on my August 21 post from Jesse stating he was hoping the they are right about the evaporating black hole thing, I had replied stating that we are bombarded daily by cosmic rays of far greater energies that the LHC can produce and that the black holes they produce evaporate, and not to worry, famous last words?, we'll find out soon, I guess a good thing is , if the scientists and my posts are wrong there won't be any one around to tell us we told you so. Hey while we're on the topic of life sucking black holes, The Center for Astrophysics has just released the coolest, closest image of the black hole at the center of our galaxy. By combining telescopes in Hawaii, Arizona and California they have come up with a winning combination that can detect structure at a tiny angular scale of 37 micro-arcseconds, or the equivalent to a baseball on the surface of the Moon!! Are you thinking what I'm thinking? probably not, my thought processes are a little off, but how cool would that be if they could now take images of the stuff left behind by the Apollo missions? put to rest once and for all whether or not we went there........ people , we did, this would be a way of proving that to all the naysayers. 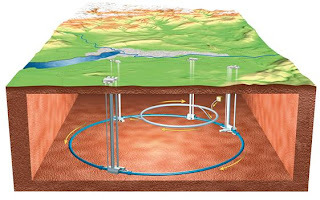 The Large Hadron Collider has been getting a bad rap lately about the black hole thing and all, below is a good rap of the collider, very interesting and fun all at the same time, enjoy. The next meteor shower I attend, and that will be the Orionids, peaking October 20,21, I'm pointing my camera and telescope at the Moon. The above animation was taking by amateur astronomer Robert Spellman shows a Perseid Meteoriod blasting into the Moon to the equivalent of around 100 lbs of TNT, quite a site, sign me up for a piece of that. Some updates on the Phoenix Mars Lander, the above animation was taken with the Lander's surface stereo imager, it is a clip of 10 frames over a time frame of 10 minutes and shows ice clouds moving over the landing site. This helps scientists track winds on Mars, the clouds are made of ice crystals similar to the cirrus clouds here on Earth. The Lander has also gathered another soil sample into one of it's ovens. This sample came from the Stone Soup 7 inch deep trench, the deepest todate, "We are anxious to find out what makes this deeper soil cloddier than the other samples" Doug Ming, Phoenix science team member. 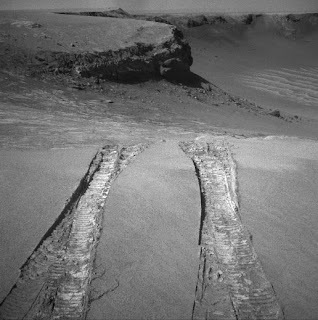 The little rover guys are still going strong, the above image shows the tracks of Opportunity coming back out of the Victoria Crater, notice two sets of tracks, it came back out over the same tracks it went into the crater with. Spirit's batteries are charging up again and is still doing science, both have made it through another Martian winter, a couple robots that were only to last 30 days have now been working for around 4 years, geez they keep going and going, the Phoenix should be so lucky. 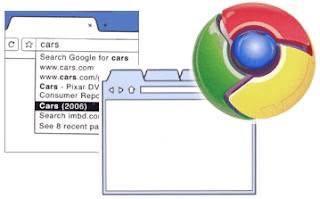 Get thee over to Google Chrome, download this browser, it's fast and it's clean, it's a clean machine. The only problem with it I've found so far is that when you do your posts it doesn't underline like Firefox your spelling mistakes, which for me is quite a big thing, my posts usually have a gazillion words underlined, right now nothing is underlined, which means I've either spelled everything right or I'm screwed, so I may end up surfing the net with Chrome and then doing my posts with Firefox. I'll leave you now with a Sunset I took a few nights ago. The above image is a thin slice of a North West African meteorite put together at the All- Russian Geological Institute (VSEGI) thin section workshop. Quite interesting how they make thin sections, they cut down a thin slice of a meteorite, glue it on a microscopic slide then grind it down further so light passes through it so mineral composition research can be done on it. 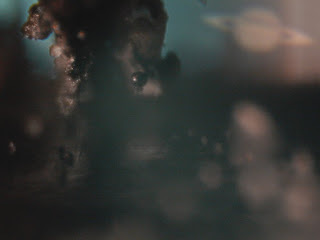 Got my hands on some slides and took some images with my microscope, notice the little black spherules, one theory is when a meteor breaks up and dissolves coming through our atmosphere the spherules survive because of their smallness and low surface area to become micrometeorites to land in your backyard to be collected be me as the below image. Apparently I'm not the only one collecting meteorites from North West Africa, aka the Sahara Desert, Evil doer terrorists have finally caught on to the value of rocks from space, it's all about supply and demand, meteorites are very rare and there are tons of private collectors with lots of money willing to pay top dollar for these precious space rocks not knowing or caring that they are funding terrorist activities. 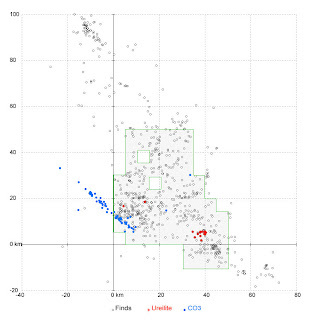 Now why North West Africa meteorites? Well in the Sahara you have the perfect backdrop for finding meteorites, they stand out, no ground cover to hide the falls and the climate is such that there is no erosion for up to 50,000 years, and they even have maps of the best locals to find them, all the legal finds have to record the area in which the meteorite was found, below image. Scientists are a little ripped about having to compete with the private collectors to obtain material for scientific research, there is a lot they can learn from meteorites such as the early formation of the solar system and our planet over 4.5 billion years ago. Some institutions such as the Smithsonian Institution won't import meteorites from North Africa knowing this area has become a haunt for smugglers and terrorists. So what can we learn from all this, well for one thing I am not a terrorist, don't belong to any cell group I'm aware of, and I have come by my NWA meteorite by legal means, but also if a meteorite lands on your car or house, it's all good, just think of the money you can make, take care of the deductible and money left over. I'll leave you with an infrared animated image of a Sunrise I took a couple days ago.